The Great Villain 2016 blogathon is upon us, hosted by Ruth of Silver Screenings, Karen of Shadows & Satin, and Kristina of Speakeasy. Check here for a full recap post – this event goes on until Friday! You can also check the #Villains2016 hashtag on Twitter. The guidelines for this blogathon were as follows: “Everyone is invited to take part in the Great Villain Blogathon 2016. All you do is pick a movie villain to cover, and then have a ball hailing the hateful and heinous, contemplating the corrupt and evaluating the evil. Villains from absolutely any era, country and genre of film are welcome.” My head immediately went to Loki, as played by Tom Hiddleston, from Thor, The Avengers, and Thor: The Dark World. The Avengers was the first Marvel movie I saw (well, technically it was Iron Man, but I saw that during my first few weeks of college when I was a nervous, homesick wreck, so I don’t remember Iron Man much at all; I need to rewatch it!). I was worried that I wouldn’t be able to figure out what was going on, because I hadn’t seen the five prequel movies, but I didn’t have a problem. The Avengers was my jumping off point for every Marvel movie to follow, and I even went back and watched the ones I’d missed. I haven’t missed one since. Loki, and by extension Tom Hiddleston, have a HUGE following – just look at the crowd reaction when he unexpectedly showed up at Comic Con 2013. I’ve been a stage actor for a few years now, and Tom’s incredible talent is a huge inspiration to me. Thor: The Dark World even went into reshoots to add more Loki into the movie. I think the overwhelming fandom love for Loki is a combination of the character’s humor, ambiguity, and good looks. 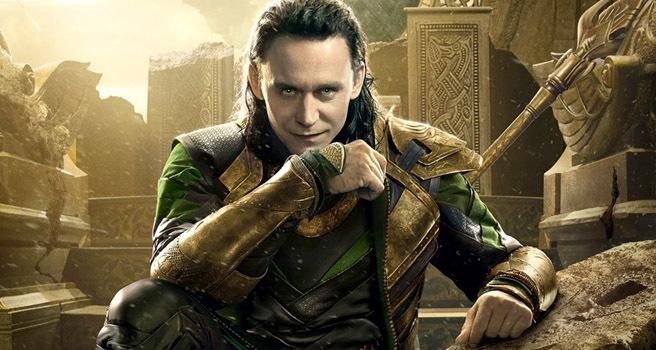 Loki is a sympathetic villain – he’s the God of Mischief and fulfills the trickster archetype, but he’s also an outsider, continually Othered by Asgard. We learn in Thor that Loki isn’t an Asgardian at all, but a frost giant from Jotunheim, a secret that was kept from him all his life. Odin also adopted him for selfish reasons, a fact that deeply hurts Loki. He’s young and angry and lashes out, and a series of escalations ends with him falling into the abyss between Earth and Asgard. In The Avengers, he wants to take over Earth (or does he? there’s a few interesting fan theories about that…), but he’s thwarted by the Avengers and sent back to Asgard as a prisoner. In The Dark World, he’s imprisoned, but Thor ends up reluctantly busting him out of jail so that he can help him fight Malekith. I can’t wait to see what the future holds for Loki – he’s one of the most interesting characters to watch because you never know what he’s going to do next. He’s always a few steps ahead of the audience. I’ll leave you with a few of the best Loki scenes I could find on YouTube so you can appreciate Tom Hiddleston’s excellent, layered performance. He could easily have been a one-dimensional, mustache-twirling villain, but he brings so much more to the table. I haven’t watched many of these films, but even *I* know about Tom Hiddleston’s Loki. His reputation precedes him. Thanks for joining the blogathon and for bringing these great Loki clips with you! I think Hiddleston is great. I’ll be interested in seeing if he can pull off a good James Bond (assuming he gets the nod to do it next). I enjoyed tis review. I’d be even more interested in him as a Bond villain! I’m rooting for Idris Elba for the next bond myself, I’d love to see them reunited 😀 Thank you so much for reading!